The PXFmini (Pixhawk Fire Cape Mini) Autopilot Shield made by Erle Robotics is a low cost and open autopilot shield for the Raspberry Pi that allows you to create a ready-to-fly autopilot with support for ArduPilot. The shield has been designed specially for the Raspberry Pi Zero but it is also pin to pin compatible with other models from the Raspberry Pi family. The PXFmini shield weighs only 15 grams and embeds all the power electronics necessary to comply with most of the existing components for drones through its I2C and UART ports. PXFmini includes 3 axes gravity sensor, 3 axes gyroscope, 3 axes digital compass, pressure sensor, temperature sensor and an ADC. It includes new JST GH connectors provide an amazing new experience. What’s best, the PXFmini schematics are open for you to hack around and create your own robots based on the design. The board can be purchased here. 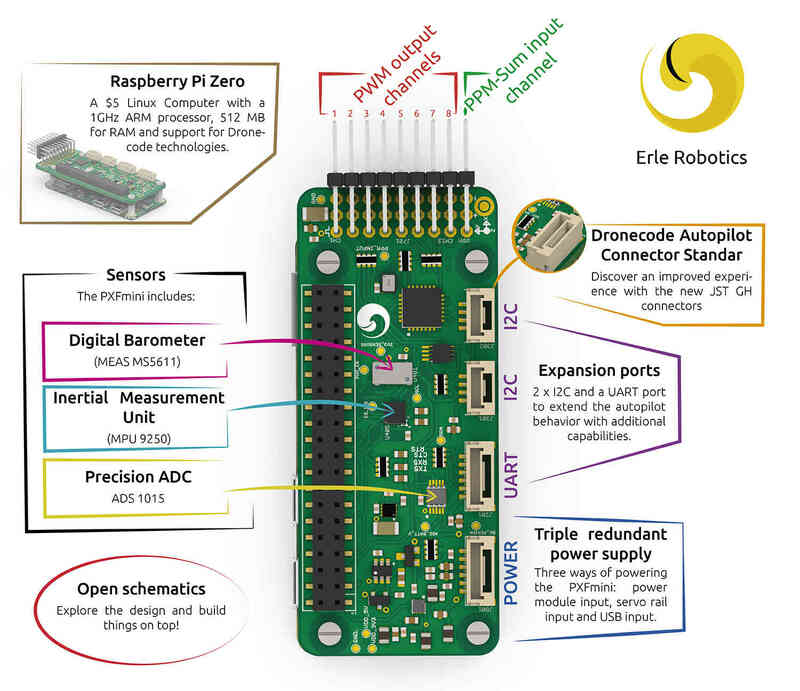 All the documentation related to this product (specs, software, schematics,…) can be found in the Erle Robotics documentation site.